Enzymes are currently used in various industries, most commonly in food, detergents, and pharmaceuticals production. Lipases are hydrolytic enzymes that demonstrate great potential as an alternative to conventional catalysts in a number of industrial applications. A complete understanding of enzymes, and their proteins structure and environmental behavior, can greatly aid in the further development of industrial applications. Supercritical Fluids Technology in Lipase Catalized Processes provides basic information about enzymes, their sources, reaction kinetics, and main industrial applications. The book focuses in lipases. their main sources, structure, and features, with an emphasis on their specificity and interfacial activity, and presents proven techniques for isolating, extracting, and purifying. 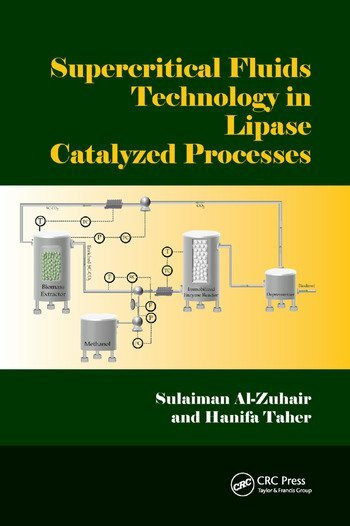 Supercritical Fluids Technology in Lipase Catalized Processes outlines the main industrial applications of common enzymes and discusses relevant challenges and innovations emerging in the field. Sulaiman Al-Zuhair is a professor of chemical engineering at UAE University. Prior to joining UAE University in 2006, Al-Zuhair worked as an assistant professor in the School of Chemical and Environmental Engineering at Nottingham University, Malaysia Campus. He obtained his PhD in biochemical engineering from the University of Malaya in 2003, his MSc degree in chemical and environmental engineering from University Putra Malaysia in 1998, and his BSc degree in chemical engineering from the Jordan University of Science and Technology in 1996. Al-Zuhair has published more than 50 peer-reviewed journal papers, two patents, and two book chapters. Hanifa Taher is an assistant professor of chemical and environmental engineering at the Masdar Institute of Science and Technology. She earned her PhD in chemical engineering from the UAE University in June 2014. Taher’s research work is focused on the enzymatic production of biodiesel from lipids extracted from different feedstocks using supercritical carbon dioxide (SC-CO2). Taher developed a novel integrated continuous biodiesel production process in SC-CO2. Taher has reviewed a number of research articles submitted for publication to international journals. "Overall, the book presents a relatively new and focused topic on supercritical fluid technology in enzymatic reaction system[s]. The writing style of the book has a good flow of information and [is] easy to understand." "... well-written … covers all aspects related to the use of enzyme to catalyze biodiesel reaction and other important reactions." "… a good combination between theory and application in real engineering… touching the key points in the field."